Trains in Britain missed scheduled stops at stations on average 160 times a day, the BBC has learned.More than 52,500 services out of a planned six million had one or more "failure to stop" (FTS) events in the financial year up to 23 February.Govia Thameslink (GTR) - which runs Thameslink, Southern and Great Northern - accounted for 16,000 of those.A spokesman said skipping stops was a "last resort when a train running late would otherwise prolong disruption". From April 2017 to February 2018, 17 in every 1,000 planned GTR trains missed one or more stops - about 50 per day. This is more than double the national average for train operators. 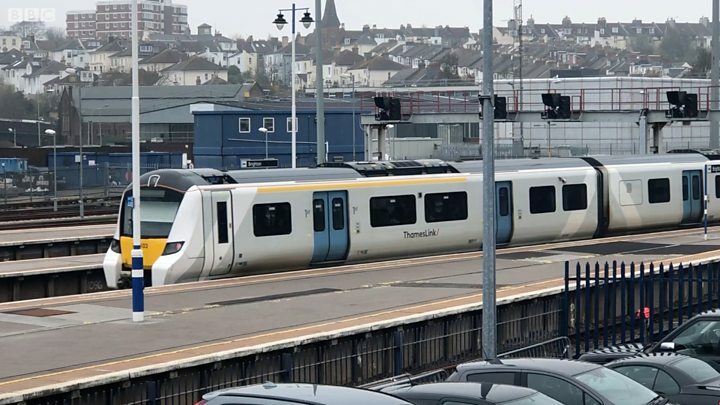 A GTR spokesman said: "We operate the country's most congested rail network and with a train departing every 27 seconds on average, even a minor delay to one train can cause a widespread and long-lasting knock-on effect to many other services and passengers across many routes. "The franchise has come under fire in recent years over an ongoing dispute with the RMT union and the worst disruption to services in the UK. Nationally there were 10,000 more FTS events in the past financial year compared to 2014-15.It equates to eight in every 1,000 services, on top of other train cancellations and delays. The Network Rail data, obtained by a BBC Freedom of Information request, compares 22 operators across four years.Over that period an average of 14 in every 1,000 GTR services missed stations. Close behind were South Western Railway, which averaged 11, and Southeastern with 10. The best performing operators were Heathrow Express, Chiltern, and Virgin Trains East Coast, with, on average, less than one in every 1,000 of their trains failing to stop over the same period.Nationally the numbers of FTS has risen year-on-year. In 2014-15 around 116 trains per day missed a stop, in 2017-18 it was 160.However according to independent regulator the Office of Road and Rail, on average only three in 10 of all types of delay are caused by the operators.Network Rail is responsible for six in 10 - usually due to infrastructure works, signalling issues or a fatality on the line. One in 10 is caused by another train company. A spokesman for Network Rail said the firm was "continuing to invest significant amounts to improve the reliability of our network".Jacqueline Starr, head of customer experience for the Rail Delivery Group, which brings together train companies and Network Rail, said it was "frustrating" for passengers.She added: "While the number of incidents causing delays and cancellations is going down, each incident is having a bigger impact due to congestion on the network and this is something that we are working hard together to get right." A Department for Transport spokeswoman said: "Across the network, fewer than 1% of stops are skipped per day. "While any inconvenience caused by stop-skipping to passengers is regrettable, it helps restore the timetable, benefitting many more people across the wider network." » Reality Check: When is a train on time?